Botanical Name: Camellia sinensis Extraction Method: Cold Pressed A wild flower which grows in China and Japan. This natural plant oil contains anti-oxidants that help to revitalize and rejuvenate the hair and skin. Camellia oil protects the skin from free radical damage, refines mature skin, and nourishes the complexion. It is easily absorbed by the skin, leaving it silky smooth without the greasy feeling, making it one of the best kept secrets in the cosmetic and hair care industry. For centuries its been used as a traditional hair conditioner and also as a treatment to strengthen brittle nails. Camellia oil comes from the seeds of Camellia sinensis, the plant from which all the tea is made. Camellia oil is a wonderfully healthy in more ways than one. It is used in a number of beauty products. Camellia oil exerts many therapeutic properties. They have healing and nutritional power, making them fit for use even in medicinal formulations. Camellia oil has exceptionally high levels of antioxidants and extremely compatible with human skin. It was known as "Miracle Oil" for skin and hair. It is proven to be very effective in eliminating or significantly reducing fine lines, red marks, stretch marks and scars, and reducing the appearance of enlarged pores. 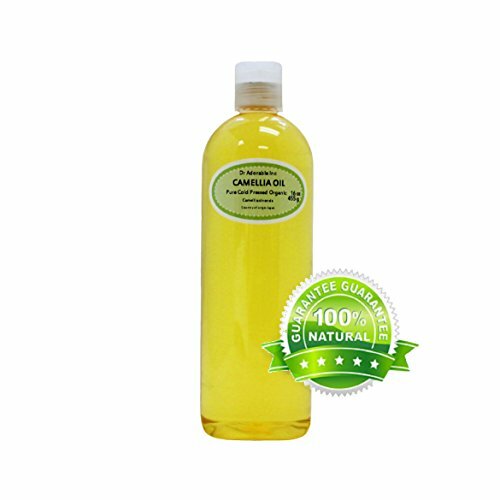 Furthermore, Camellia Oil possesses a unique active constituent known as squalene and has remarkable moisturizing and anti-aging properties. It is the most easily absorbed of all natural oils and can penetrate into the deepest layers of the skin without leaving skin oily or greasy. For this reason Camellia oil was one of the best kept secrets of cosmetic industry. With Camellia Oil you get 100% natural moisturizer with no fillers of any kind, and you may not need your lotion again, or use it much less that you usually do. Camellia Oil can be used as day or night face and body moisturizer and natural makeup remover. Camellia Oil is nature's best anti-frizz serum, superior to even Argan Oil. It makes hair strong and shiny. Camellia Oil is also perfect as deep hair conditioner. Antioxidant Camellia oil, like green tea is a superb antioxidant. 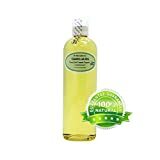 Hair conditioner Camellia oil promotes recovery of wounds and scrapes. Anti-Aging protects the skin from free radical damage due to its antioxidant. Anti-microbial It stops the proliferation of microbes. Astringent It has a mild astringent effect which makes it good for treating injuries and scars. Anti-inflammatory reduces inflammation on the skin. Analgesic natural pain reliever. Anti-Allergic can help in suppressing an allergy. Botanical Name: Camellia Sinensis. Extraction Method: Cold Pressed. A wild flower which grows in China and Japan. This natural plant oil contains anti-oxidants that help to revitalize and rejuvenate the hair and skin. Camellia oil protects the skin from free radical damage, refines mature skin, and nourishes the complexion. It is easily absorbed by the skin, leaving it silky smooth without the greasy feeling, making it one of the best kept secrets in the cosmetic and hair care industry. For centuries its been used as a traditional hair conditioner and also as a treatment to strengthen brittle nails. We are buying our oils from organic certified supplier, made with organic ingredients. Your item(s) will be shipped the same business day or next business day of confirmation of payment if received by 3:00 pm PST. (not including weekends or holidays). When you receive your item and are pleased with our transaction, please let us know by leaving positive feedback, we will do the same for you in return. Look forward to do business with you, H&B OILS CENTER Co.
Botanical Name: Camellia sinensis Extraction Method: Cold Pressed A wild flower which grows in China and Japan. This natural plant oil contains anti-oxidants that help to revitalize and rejuvenate the hair and skin. Camellia oil protects the skin from free radical damage, refines mature skin, and nourishes the complexion. It is easily absorbed by the skin, leaving it silky smooth without the greasy feeling, making it one of the best kept secrets in the cosmetic and hair care industry. For centuries its been used as a traditional hair conditioner and also as a treatment to strengthen brittle nails. It is suitable for food and cosmetic use.